Site Events luxury disabled wet room combines a toilet and shower in one accessible unit. This unit also has a baby change facility making it the perfect multi functional unit for your event. The trailers contain handrails and washing facilities placed at a low level for maximum user-friendliness, and the unit itself is very spacious, making it easy to manoeuvre a wheelchair around once inside. Complete with towing frame, these disabled trailers are highly portable and ideal for small or large events where wheelchair accessibility is essential. We also have our standard disabled loo hire. We suggest 1 luxury disabled unit per 100 guests at your event. Our luxury disabled wet room combines a shower, toilet and baby change area all into one unit. This multi-use unit offers a ramp for accessibility as well as low level handrails around the unit. The luxury white exterior matches our luxury trailer range and therefore can be incorporated into our other units without standing out. 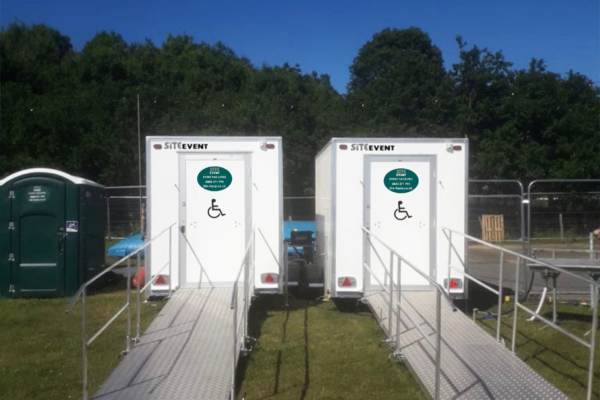 The luxury finish on the toilet trailer ensures every person at your event has luxury toilet hire. The wet room requires 16amp 240v power & water and a minimum 1 bar water pressure, IBC and pump for the shower. The towable luxury disabled wet room hire is a fresh water unit and can be manoeuvred to any location where the ground is level and there is a power and water supply. We can deliver this unit across the South of England including Hampshire, Berkshire, Dorset, Essex, Kent, Wiltshire, London, Surrey, Sussex, Buckinghamshire & Oxfordshire. Please speak to our friendly sales team on 0800 371994 who can give you more information about installing this unit to your specifications.